Witness the magical site of the pryamid lit up at night! 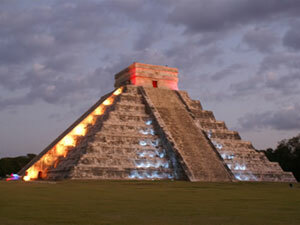 Chichen Itza is one of the New 7 Wonders of the World! When it gets dark we are given the opportunity to listen and admire a projected light shadow over the architectonic elements of the building resembling a serpent descending to the ground (equinox show), Mayan warriors playing the ball game and the sound of death and life. This is an exciting show full of history, light effects and awesome ancestry. Only available on WEDNESDAYS. Return to the ruins to stay for the Light & Sound show 7PM - 8PM winter / 8PM-9PM summer hours. WEDNESDAYS ONLY. Pack for this tour: Sunblock, sunglasses, hat, bottle of water, camera, swim suit and towel. **TIP: Meal is at 5PM so grab a bite to eat before you leave the hotel in the morning or bring a snack.